I had been trying to meet with my friend Jaclyn for a while. We are both constantly busy and work in the world of diversity and inclusion. Jaclyn works in Public Relations for the Michigan Paralyzed Veterans of America and I have a diversity consulting practice and write books for kids about self-esteem and acceptance titled the "Who I Am" series. We both decided to meet at Biggby for our favorite treats and talk about our recent and future projects. In between our sips we realized that our industries are very unified in many ways. We thought about those who work in similar areas who could use extra support, resources and encouragement to reach their goals. At that point...we knew that we were on to something. Jaclyn and I decided on developing a collaboration called the "Dimensions of Diversity Alliance". This group would encompass many organizations that worked to create understanding and diversity. Our first kick-off will be on February 25th. We have had many planning meetings since that fateful day in January and we always marvel about the link between coffee and action. Ideas can be born anywhere. I tell those I teach creative writing to to take a step and think hard because an idea or story is present. Our story of inclusion became a reality in Biggby and if you knew how much coffee I drink on a daily basis I think this sums up the story of my life. Do you have any ideas that need implementing? Go somewhere bright and friendly and see if positive energy introduces the next steps for you! Aren't coffee shops great? You can see why revolutionaries have always met there. And artists, musicians and those types. And just regular folks who want to catch up with each other. Coffee Shops: friendly, inviting, artistic and vaguely conspiratorial. My kind of place. lol...I agree! Biggby is my favorite place to write and meet clients. 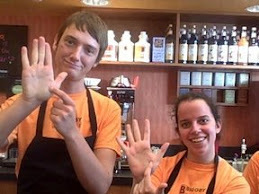 :) Great ideas are truly born at Biggby! well..you know we say...B-happy, MAKE friends, drink great coffee, love people and ..HAVE FUN - makes sense to me! Tara, you are SO right! Ideas can be born anywhere. 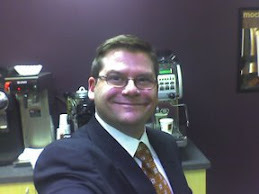 I know that I've had quite a few come to me while in the Biggby's near my home, and I've made business connections there too. I always suggest to my clients to change up their environment when it comes to work. Sometimes we can be more productive when we go outside of the norm, especially when it comes to environment. The funny thing is, for me, I often forget how great it is to just hang out at our stores--usually if I'm there, I'm in full-on-work-mode...having fun, for sure, because I love what I do, and if I'm in the store that means I get to work with customers too, which is a blast, but I really can't remember how long it's been since I've just hung out and read a book, or done some writing, in one of our stores! Thanks for the nudge towards "smelling the roses!" Coffee shops in 18th century England were called "Penny Universities" and were gathering places to meet, talk, learn and share ideas. Tara thanks for sharing your thoughts.